In social media world, many individuals are much more popular than brands themselves. They are so recognizable in social media that we might get interested in a company thanks to them, and not the other way around. 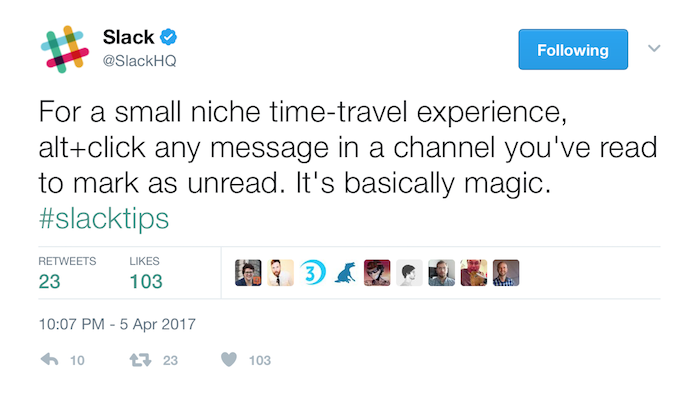 Gary Vaynerchuck from Vayner Media? Neil Patel from CrazyEgg? Or a polish example, Michal Sadowski, who gets much more buzz in social media than his company, Brand24, itself. Even celebrities who promote Coca-Cola or Pepsi have much more followers than these brands themselves. Why is that? While I was doing a research for this post, I stumbled upon a great video by Tara Hunt from truly Social in which she explains what YouTubers have that brands don’t. I will bring up some of her advice and add some that I think are crucial for all social media platforms. I would like to get to the core of this and explain why individuals get more followers than brands. And let me be clear, I’m not saying that brands can’t do the social media right – there’re tons of examples from brands that we can and should follow. I’m saying, more brands could make their social media better. And they can learn a thing or two from people who do it for a living. One of the first things we do after we wake up is social media check-out. Our feed is full of bloggers’, writers’ and fitness coaches’ posts, with morning trainings, perfect breakfasts in bed or walks in the park, depends on who you follow. These people keep us tuned. But do we see posts from brands that we observe? Rarely. Most brands publish posts on social media when something big happens, like integration with the other product, a training course from programming with a well-known person in the industry or a big cake on CEO’s birthday. This doesn’t happen often, because they’re all dig into work every day. On a daily basis they publish something more down-to-earth, like blog posts or some new deals that their product offers. Whenever they have something like that to share, their social media activity rises. And what do they want from their fans? They want them to click on the link, read this blog post, check out this landing page and basically buy or subscribe to their product. What is the conclusion here? Brands are more campaign focused. They have something to promote on a specific day, so they post it everywhere they can. How brands can improve it? They can promote regular content, not only with links to the blog post and landing pages but also with informative links to different sources. They can ask questions and generate discussions. They can stay active on social media, without always “asking” for a click. Read the article “The Social Media Marketing Strategy”. 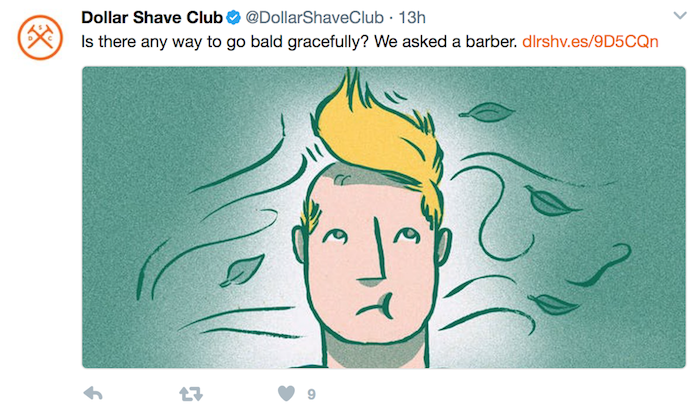 Examples: Mailchimp (Instagram), Dollar Shave Club (Twitter). Individuals promote mostly themselves, so even if they are lifestyle bloggers or they have a YouTube channel with book reviews, they post pictures of themselves when they prepare for shooting a video, or when they work from a coffee shop. They keep us informed and allow us to look at the backstage of their work – which is what we’re curious about. We are their companion during the day. We’re part of their lifestyle. Brands rarely have this focus to keep people interested throughout a day. And there’s an easy way to do it. You can provide customer service through your social media channels and be open about it. This was a brand account, it might be a radio, but they took what’s best from individuals – connection through personalization. It’s different than just leaving a note in your Twitter BIO: “We answer questions on Twitter 24h” and just wait for somebody to report an issue. Examples: DiGiorno Pizza (Twitter), Slack (Twitter) – they make people a part of their workflow. We feel connected with them. And that’s what brands should strive to. Each social media manager has their own boss who evaluate the result they achieve. In their work, they need to answer questions like: How many people come to our page from social media? How many of them become customers? Are these actions even worth the money? Looking from a company’s perspective, it’s all rational. You need to somehow measure creative work and you can’t leave it up to chance. That’s the reason brands have a social media strategy that they stick to – everything is meticulously planned. Unfortunately for many brands, social media are just marketing platforms they can use to promote their product. People rarely say to somebody who has a business: “Use social media to connect with your customers.” I think it’s more like: “You can use social media to promote your products and reach out to potential customers.” Even lately I got this comment to my blog post about social media strategy: “Social media now is very easy to find with. With all the media sites out there, you probably gonna communicate easier and can reply anytime as long as your advertise gets the exposure.” I disagree with this comment, and somebody surely didn’t understand my message. Individuals see social media as a way of connecting with people. They have platforms in which all their fans meet. Since the very beginning, they treated social media as a way to build a community. Brands do this rarely, because they feel like customers should reach out to them. And they should strive more for connection and less for promotion. Another thing is that individuals have more space when it comes to social media and nobody controls their posts. They engage in a conversation with their subscribers and followers and don’t exactly check the ROI of it. They just live it. They share their lives and it’s a part of their job. Brands mostly inform people about specific things they did and when they post a funny gif, they can be quickly judged for the low quality of content. Luckily, there are brands that are not afraid to be themselves. They are funny and people appreciate that. Check out the post “How to use Twitter for business.” Speaking your own language is always good. And it’s better to have a bunch of people who have the same values as your brand than to be transparent. On social media, individuals barely think about others as a competition. Depending on the industry they work in, many of them create a supportive environment. They promote others’ work, encourage each other and exchange ideas. If an individual likes somebody else on social media, they might want to encourage you to check them out. And because they work in the same industry, chances are that you will probably like them too. Besides, many people who are looking for channels on YouTube to help them learn something, subscribe to all channels related to the topic, and not just one. It’s not the same with brands. In this case customers need to choose one, so recommending other brands from the same industry might be insane from the business point of view. The main goal of companies is to earn profit. But if somebody asks about the product you don’t offer, you can try recommending a competition. I think that it’ll gain you some credibility in people’s eyes. Brands can create relationships with companies from different areas. Like when airlines connect with car rentals to create special packages for customers, You can create such opportunities to seduce more customers and show that you’re open for co-operations – and believe me, customers love it. 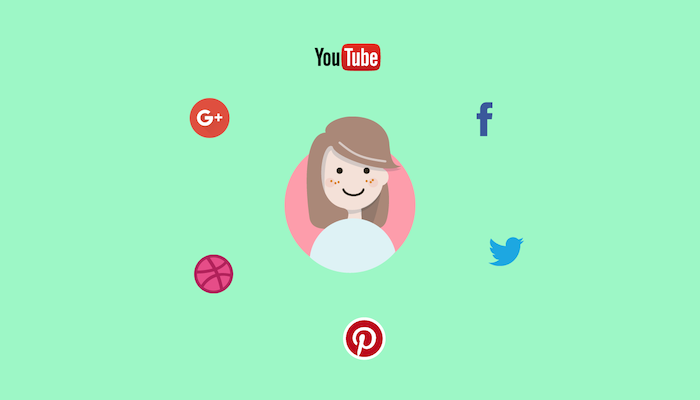 Individuals often have access to more features within social media platforms. Let’s take Snapchat for example. You can’t set up a profile as a company there (unless you’re signing up as an advertiser). Or for example LinkedIn – if you want to promote your product, you can’t join Groups, as only individuals can do it. There are a lot of experts in these groups, with whom you can create a relationship and start a discussion – basically to create buzz around your work. As a blogger, I can tell you that it works. We’ve created many discussion on LinkedIn Groups and we can see a large number of entries from this source on our blog. To use the potential of all social media platforms, you might want to create individuals among your company. At LiveChat for example, our content team has profiles on Twitter, Google+ and LinkedIn. We constantly build our base of followers. We also write guest posts for related platforms to increase our reach, and it’s working. People associate us with LiveChat and we want to expand as much as we can. So should you. They are many brands that are great on social media. But they’re also the ones who still treat them as marketing platforms, which they can use to promote their products. Brands should learn from companies who do social media right and they can also learn a lot from successful individuals. Because individuals on social media are a great example of how brands should connect with people, present themselves and keep in touch with their followers. To become popular, brands can also create individuals themselves, as those individuals will most likely bring attention to the company itself.